Meeting the Characters! Tips and Tricks for Meeting your Favorites!!! 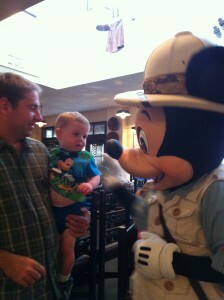 My son meeting Mickey at Tusker House! Part of the fun of a Disney vacation is the opportunity to meet your favorite characters. I have compiled a few tips and tricks to make meeting your favorite movie stars as stress free and easy as possible! 1. To get the most time and most attention from the characters schedule a character meal. There are many restaurants on property that offer characters, but only certain ones appear at certain meals. Know who you would like to meet and what restaurants they appear at. Here is a quick cheat sheet! 2. Grab a times guide when you enter the park. This will list character meet and greet locations and times.You can also check the tip boards and ask cast members the meet and greet schedule! 3. Keep and eye out for “handlers” and photopass photographers who are just lingering around. Handlers are often wearing blueish grey shirts and pants and help the character to interact with guests. If you see these folks standing around you can bet a character is on their way out! 4. You can have characters sign an autograph book or article of clothing that is not being worn. It is a good idea to be prepared for the character with the item you wish to be signed opened to the correct page or out of the bag. Another good idea is to provide the character with a thick pen or marker that will be easier for them to handle. 5. A great way to see a lot of characters at once is to attend a parade. Though the characters will not have time to sign autographs or stop to chat, they may shake your hand or wave! This is a great way to get uneasy children acquainted to seeing the larger than life characters. 6. Check out some character spotting websites such as Kennythepirate.com. He has tons of up to date information for character lovers! This entry was posted in Planning Tips, Top Five. Bookmark the permalink.